Is a subscription-based service that provides convenient features such as voice communication in case of emergency, online security, one-on-one operator assistance, and the transmission of important messages regarding your vehicle’s status. For information on traffic rerouting and traffic information updates, provided by the AcuraLink server, see the Navigation System Manual. AcuraLink also provides services you can operate from the Internet or your smartphone. To subscribe to AcuraLink, or to get more information about all of its features, contact an Acura dealer, or visit owners.acura.com (in U.S.) or www.acura.ca (in Canada). Your vehicle may not be able to connect to the operator if the battery level is low, the line is disconnected or you do not have adequate cellular coverage. You cannot use emergency services when: • You travel outside the AcuraLink service coverage areas. • There is a problem with the connecting devices, such as the ASSIST button, microphone, speakers, or the unit itself. • You are not subscribed to the service or your subscription is no longer valid. You cannot operate other navigation- or phonerelated functions using the screens while talking to the operator. Only the operator can terminate the connection to your vehicle. 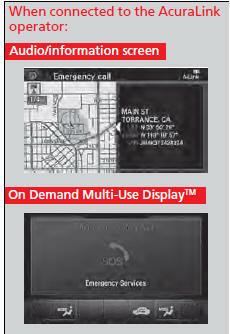 If you need to talk to the AcuraLink operator in an emergency situation, you can manually connect to them by pressing the ASSIST button with the power mode in ACCESSORY or ON. 1. Open the cover attached to the ceiling console. 2. Press the ASSIST button. - You are connected to the AcuraLink operator. Do not press the button while driving. When you need to contact the operator, park the vehicle in a safe place. If the unit fails to connect to the operator, it automatically cancels the action after three minutes. 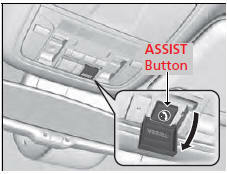 In an emergency, the cover can be broken through to press the ASSIST button. Your subscribed telematics service provider can track your vehicle’s location, remotely lock or unlock doors, and help you find your vehicle. To use these features, you need your user ID and personal identification number (PIN). This feature searches and tracks down your vehicle position even if it is on the move. If you believe that your vehicle has been stolen, contact the police as well as the provider. The provider can remotely lock or unlock doors upon your request. 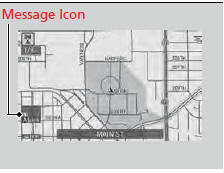 This feature is convenient to use when trying to locate your vehicle in large areas, such as a crowded parking lot. If you cannot locate your vehicle after using the remote transmitter’s answerback function, you can contact the provider which can then flash your vehicle’s exterior lights and sound the horn. If the security system in your vehicle detects an abnormal condition, such as someone tampering with the lock on your vehicle, the provider notifies you by email. The contact information of your provider, your user ID and PIN will be given when you subscribe to AcuraLink. If you forget any of the above, contact a dealer, or go to owners.acura.com (in U.S.) or www.acura.ca (in Canada). You can also activate the remote door lock/unlock and vehicle finder features from the Internet or using your smartphone app. Ask a dealer, or visit owners.acura.com (in U.S.) or www.acura.ca (in Canada) for details. The lights will stop flashing and horn will stop sounding under the following conditions: • When 30 seconds have elapsed. • You unlock the doors using the remote transmitter. • You unlock the doors using the keyless access system. • You unlock the doors using the built-in key. • The power mode is set to ACCESSORY or ON. 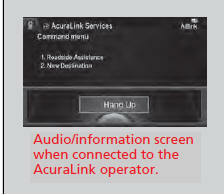 Connect to the AcuraLink operator when trying to find a destination or for roadside assistance. - Connection to the operator begins. - To disconnect, press the selector knob, select End Call on the On Demand Multi-Use DisplayTM, or press the Hangup button. Remain attentive to road conditions and driving during operator assistance. AcuraLink sends you messages on vehicle features, safety and emissions recall campaigns, maintenance reminders (U.S.
models only), and diagnostic information. When you receive a new message, an icon appears on the audio/information screen. There are six message categories. • Feature Guide: Appears for the first 90 days of ownership, introducing vehicle features each day. • Quick Tips: Supplements your Owner’s Manual with updated vehicle information. • Diagnostic Info: Appears when a warning indicator or message comes on. Rotate to select Check Later or Check Now. - Selecting Check Now lets you know if you should see a dealer immediately or later in accordance with the warning severity level. • Scheduled Dealer Appointment (U.S. models only): An appointment made through the Acura server or Acura Owners website can be rescheduled or canceled from this option. • Maintenance Minder (U.S. models only): Lets you know which maintenance item is due along with a reminder message. • Recalls/Campaigns: Reminds you of a recall or important safety information. You should also be notified by mail. Messages may not appear immediately after your vehicle purchase. It can take several days for your dealer to register your vehicle’s ID. If an icon includes an exclamation point, it indicates that Acura gives high priority to this message compared to the one without. 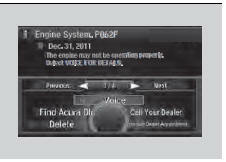 Message categories can be added, edited, or deleted through broadcast messages from Acura. You can call your dealer, find the nearest dealer, or schedule appointments (U.S. models only) from the message options in Maintenance Minder (U.S.
models only), Recalls/Campaigns, and Diagnostic Info. 1. Press the INFO button, rotate to select AcuraLink/Messages, then press . - If your display has changed from Info menu to Current Drive, press the MENU button. 2. Rotate to select a category, then press . - If there are unread messages in a category, a message icon appears next to that category. 3. Rotate to select a message you want to read, then press . While a message is displayed, you can use options to take immediate action to the message. Available options are: • Voice: Reads the message aloud. Select Stop to cancel it. • Find Acura Dlr. : Searches for the nearest Acura dealer. • Delete: Deletes the displayed message. Rotate to select this option, then press . • Call Your Dealer: Calls your Acura dealer using HFL. The available options vary by message category. You can delete all messages in a category at once. Voice is available only when the Message Auto Reading setting is in ON, and the language selected is English. • Schedule Dealer Appointment (U.S. models only): Automatically sets an appointment date at your dealer. • Phone number: Dials a number displayed in the message via HFL. 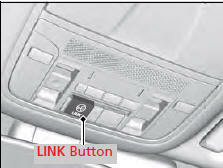 • Diagnostic Info: Updates the current diagnostic message by connecting to the Acura server using HFL. You can confirm the scheduled appointment date when you receive a Maintenance Minder or Recalls/Campaigns message, or reschedule any existing appointments. 1. Select a Maintenance Minder, Recalls/ Campaigns, or Scheduled Dealer Appointment message. 2. Rotate to select Scheduled Dealer Appointment or Reschedule Appointment (depending on the screen). - A suggested time and date are displayed. 3. Rotate to select Confirm Appointment. Press to accept the time and date. 4. Press to select OK.
To set up an automated dealer appointment when a regular maintenance is due, visit the Acura Owners website at www.owners.acura.com (in U.S.) or www.acura.ca (in Canada), and set the required option. A reminder message will be sent as the date for the dealer appointment approaches. A reminder message will also be sent if you schedule an appointment online using Acura Owners’ Schedule Service Appointment function. If you are not satisfied with the proposed appointment date and time, call your dealer directly. To cancel the scheduled appointment, select Cancel Appointment when a message is displayed.